The essential, 45-page, pocket-size edition of the greatest gift from our Founding Fathers: the two most fundamental documents for Americans. The Constitution of the United States and The Declaration of Independence are two of the most important documents in American history. Conveying the principles on which the country was founded and providing the ideals that still guide American politics today, these are the essential works from our history. Signed by the members of the Constitutional Convention in Philadelphia on September 17, 1787, The Constitution outlines the powers and responsibilities of the three chief branches of the federal government, as well as the basic rights of the citizens of the United States. 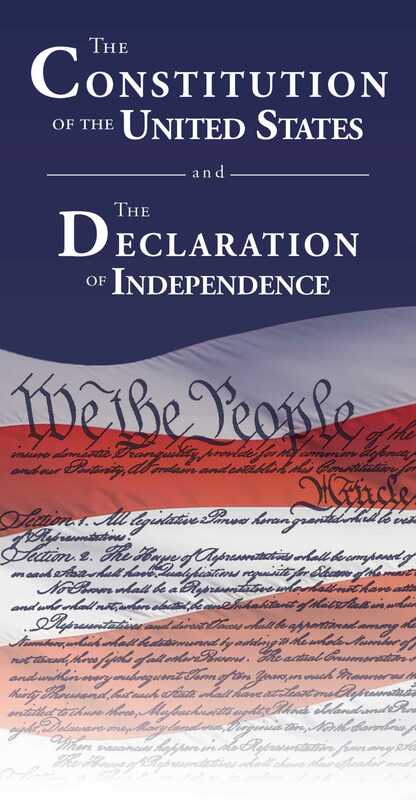 The Declaration of Independence was crafted by Thomas Jefferson in June of 1776 and it provides the foundation of American political philosophy. Collected here in one affordable, pocket-sized volume are some of the most valued pieces of writing in the history of our country. This edition contains The Constitution of the United States of America, including The Bill of Rights and all of the subsequent amendments, as well as The Declaration of Independence. These are word-for-word facsimiles of significant documents… Every American should own a copy.